At the heart of Star Trek Armada II are the most exciting elements from the Star Trek episodes and movies: leading fleets of starships into combat, exploring new planetary systems throughout the Alpha and Delta Quadrants, and carefully treading the delicate balance between peace and war among six different races. 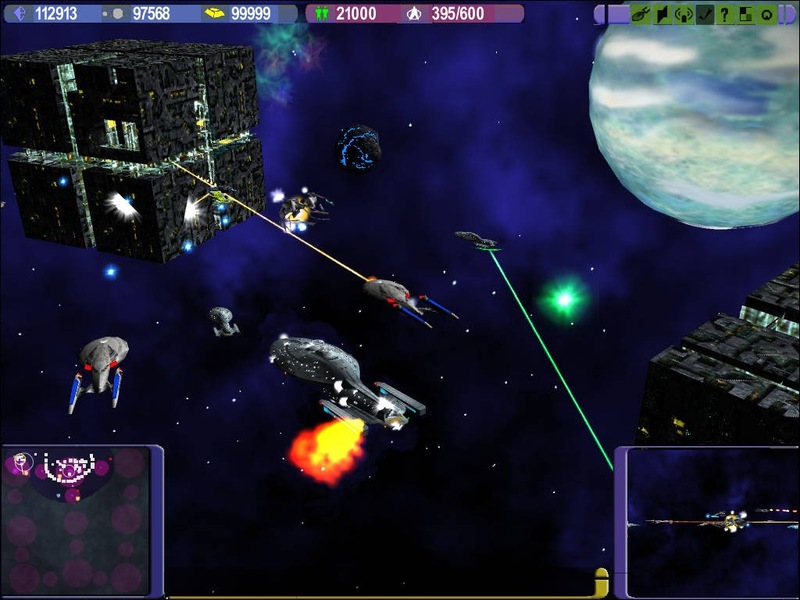 As in Star Trek Armada, the player has the ability to command large numbers of ships in a top down interactive environment. 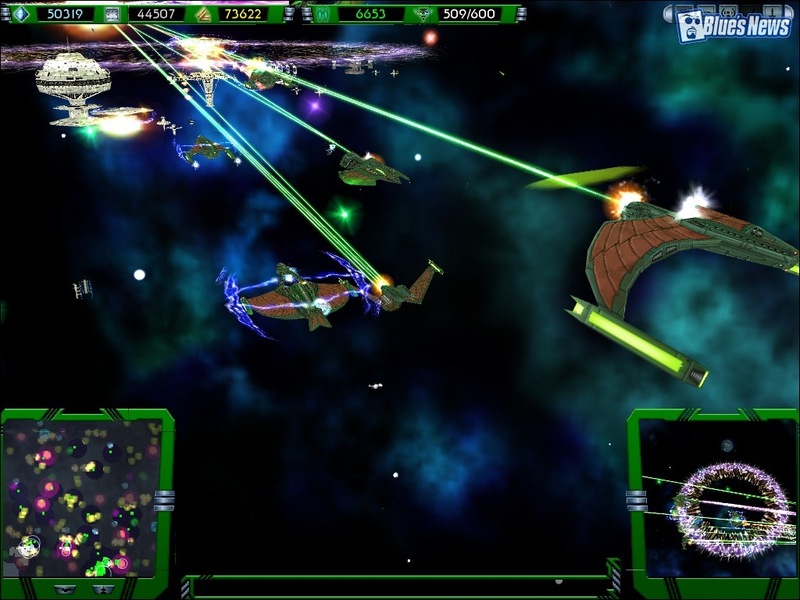 Star Trek Armada II takes the concept to it's logical conclusion by allowing the player to also experience the game in a full 3D mode, so the battles and elements of space conquest and exploration take on the vividness of the best of Star Trek. With over 45 new ship classes, 22 new special weapons, over 30 new stations, building a devastating armada has been taken to a new level. This demo allows you to play either as the the Federation or the Borg, and includes multiplayer and Instant Action, aswell as playing online. You can also play the first federation mission in single player. This Readme file contains last minute information regarding Star Trek: Armada II Demo. Due to size limitations also there is no ability to display the game intro movie or credits. **Please note that the Armada II demo is not supported on Activision's customer service line. Calls regarding this demo will not be accepted. Support options include newsgroups, and online forums on Armada II's fan sites including gaming.startrek.com. In 30 missions divided into three campaigns, the player experiences the excitement of the story unfolding from the perspective of the United Federation of Planets, the Klingon Empire, and the Borg Collective. Commanding the ships and infrastructure of these very different races, the player is able to feel the excitement of exploring new sectors of space with the Federation as Captain Jean-Luc Picard, the thrill of conquering worlds and crushing enemies as the Klingon Chancellor Martok, and the cold efficiency of assimilating worlds and vessels as the Borg Queen. As the commander of an armada, the player must make choices that will affect thousands of lives and the future of the galaxy. The universe has been further brought to life with the addition of planets to be colonized, additional types of resources to be utilized, and a detailed trading and economics model. A powerful armada must have the infrastructure to support it, so the player is given the resources and knowledge to make full use of this rich new universe. With over 30 Multiplayer maps to choose from, players can test their skills against up to seven other players. 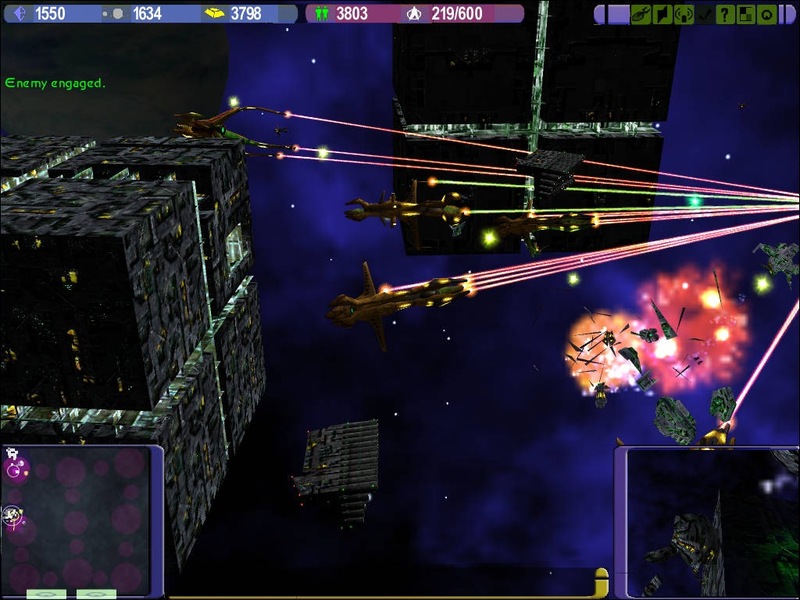 In addition to the Single Player races (Federation, Klingon, Borg), the Multiplayer side of Star Trek Armada II allows players to match wits and armadas as the Romulan Star Empire, the Cardassian Union, and as Species 8472, each with their own unique compliments of ships, stations, and special weapons. Like in the Star Trek universe itself, success in Star Trek Armada II depends on careful strategy, deft decision making, and quick reactions. The scope of the game brings all this and more into the hands of the player. At the heart of Star Trek Armada II are the most exciting elements from the Star Trek episodes and movies: leading fleets of starships into combat, exploring new planetary systems throughout the Alpha and Delta Quadrants, and carefully treading the delicate balance between peace and war among six different races. A 100% DirectX 8.0a or higher compliant 8MB or higher 3D video card and driver is required to play Star Trek: Armada 2. Some 3D accelerator card brands may not be compatible with the 3D acceleration features utilized by Star Trek: Armada 2. Please check with the card's manufacturer to ensure DirectX 8.0a compatibility. Important Note: This product uses DirectX 8.0a technology, which requires your system to have the latest Windows 95/98/2000/ME drivers (for CD-ROM, video card, sound card and input devices) that fully support DirectX 8.0a. **Some but not all of the cards with the chipsets listed above have been tested on Windows(r) 2000, ME, and XP. For Windows(r) 2000, ME, and XP 3-D support, please refer to your hardware manufacturer for 100% DirectX 8.0a compliant drivers. * To use GameSpy Arcade you are required to have Internet Explorer 4.0 or a newer version installed. The Winsock 2.0 update is also required, however it is included with the Star Trek: Armada II Demo and will be installed as part of the game installation if you don't already have the update. * In rare circumstances you may experience Out Of Sync errors in multiplayer games. Your game is no longer capable of maintaining synchronization between the players in the game. The game will not re-synchronize later. It is recommended to discontinue playing your game at this point and launch a new multiplayer game. Out Of Sync errors can occur on all Internet connection types. * On minimum specification machines, if playing on a machine with high memory fragmentation, it might take longer for the game to show the Admirals Log after the completion of a multiplayer game. This occurs when the game is freeing up available ram after exiting the multiplayer game. It is recommended that you defragment your hard drive to improve performance of virtual memory. * Playing from behind a firewall for GameSpy is supported, however you will need to expose specific ports on your network to do this. Please review the HELP screen from within the multiplayer menu or view the supplied nethelp.txt file that is located in the game folder for a listing of the specific ports that will need to be opened. * When playing games via GameSpy you will have the option of aborting the connection between those machines by using the CANCEL button. If your game doesn't resolve the connection you can press the CANCEL button to abort the connection attempt and return to the multiplayer menu. If you press the CANCEL button it may take up to two minutes to resolve the connection and return to the menu. * If you have Norton Personal Firewall installed it is recommended you set your security and privacy settings to Medium or Low or temporarily disable your firewall during internet play. Leaving the security and privacy settings on High may cause the firewall to prompt the user numerous times during the GameSpy login process, and interfere with the users ability to connect. Please review your Norton Personal Firewall documentation for instructions on modifying these settings and what security issues might arise from doing so. * In multiplayer games it is recommended that you don't play with Officer Limit set to More/MAX or infinite resources enabled when playing with machines that are at or near the minimum system requirement. These multiplayer modes should only be enabled when all machines in the game are high performance systems as the performance of the game will be limited to the performance of the slowest machine in the multiplayer game. * Increasing the game speed in multiplayer games will have the potential of adding additional lag or create performance issues rather then increase game speed. Typically this will happen when playing with machine at or near the minimum system specification. * Only Battleship type vessels can attack planets. Each of the six races includes a vessel that is capable of assaulting planets. * If you use the Borg Nanite attack against the AI this will render them unable to use their special weapons for a short duration. * When the players vessels capture enemy stations or ships they will add additional officers to control the new captured station or ship. If this causes the player to equal or exceed their officer cap then they will need to decommission ships or stations to be able to build additional units. In the case of the Borg they will add additional power nodes rather then officers and that will impact their power nodes cap in the same way. * Special weapons use different amounts of special energy. Some special weapons can fire multiple times before you will need to recharge your special energy. Special weapons energy will recharge over time. * Building multiple versions of the same research station allows you to spread out your researched items or improvements among multiple stations. You are also capable of building the same upgrades for each station. This offers you the advantage of having a backup in case one station is eliminated. * In green alert ships under attack will not default to flee. * New units added to an existing fleet will retain their current autonomy setting. It is recommended that you update the autonomy setting for the fleet as you add additional units to maintain your autonomy settings for the group. * The AI menu for starbases will define the default AI settings for all new ships constructed in those facilities. * The Sovereign-class vessels' Corbomite Reflector special weapon will not reflect pulse phaser-type weapons damage. * Under certain circumstances you may not be able to detect warp suppression fields near planets. * Mining facilities do not need to be placed near Latinum clouds to mine resources as the freighters deliver the collected materials to your starbase. * When assigning waypoints you can only plot a path through space. You will not be able to define different heights for the waypoints. * You can build planetary shields on planets to help protect your colonists. It is also recommended to protect your planets with turrets or combat vessels. * The Admirals log does not list derelict ships, ships destroyed in nebulae, or decommissioned ships as being lost in the included tally. The lost field shows only ships lost to combat. * The ALT-G command can be used to show or hide the zero grid. There are three unique states. Each time you press ALT-G it will cycle between those states. You can have the grid shown, grid shown with height indicators in the z-axis for ships that are currently selected, or completely off. * For ships with the Transport Attack function you will only be able to use this attack method with ships, stations, or planets that have an existing crew. If the crew has already been eliminated then you can transport normally. * Ships, Stations, or other in-game objects can't be attacked when they are covered by fog. You will either need to use forward ships to spot a location for artillery, or move ships in till a ship can see the target to fire. * It is not recommended in instant action games to play with the maximum number of AI players with Unlimited Resources, Speed set to 6, or Officers set to Max when using a machine at or near the minimum system requirement. * In the single player missions the player is capable of taking over enemy construction vessels, research stations, starbases, and shipyards. For gameplay reasons creating new vessels or additional research is not allowed. However, in the multiplayer or instant action portions of the game this is allowed. * In the single player game not all enhancements, ships, stations, or weapons are available in all missions. 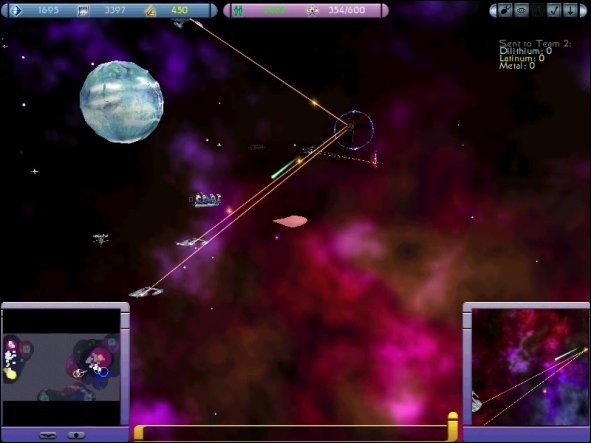 Typically as missions progress through the campaign more technology will be made available to the player. * It is recommended that the player use the search or search and destroy command to scout out the map areas and uncover potential enemies. * Due to the method being used to support bump mapping you will not be able to enable bump mapping on Matrox G400/G500 cards. * In some instances increasing hardware anti-aliasing to 4x or higher may cause minor graphical artifacts on some of the interface elements. * It is recommended to not have a screen saver or standby/sleep mode active while playing the game. You may experience graphics corruption if the screen saver or standby/sleep mode activates during gameplay. * It is recommended that you have a minimum of twice the amount of free virtual memory for your existing memory size. If you have 64MB of ram then you should have 128MB or more of virtual memory configured in windows. If you have 128MB of memory then you should have 256MB or more of virtual memory. * On original Windows 95 machines (non OSR1/OSR2) you may experience scrolling problems within the game if you have your Windows task bar set to "Always On Top". For best in-game performance adjust this so that the functionality is disabled. * We have experienced issues with the latest version of Netscape 6.1 in which some of the links on the start menu and links within the Technical help file do not work properly. This is unique to Netscape 6.1 and should not effect users of Internet Explorer or earlier versions of Netscape. TM, (R), (c) 2001 Paramount Pictures. All rights reserved. Star Trek and related marks are trademarks of Paramount Pictures. (c) 2001 Activision, Inc. Activision is a registered trademark of Activision, Inc. All other trademarks and trade names are the properties of their respective owners. The ratings icon is a trademark of the Interactive Digital Software Association. Uses Bink Video. Copyright (c) 1997-2001 by RAD Game Tools, Inc. This product is intended solely for private home use. Public performance or other use is expressly prohibited. I have tried installing it and it runs fine. However, I am using XP SP1. SP2 does cause problems with running legacy programs such as this, which is why I don't use it. In my mind the operating system exists to operate systems, and when it fails to do that I fail to see the point in running it. The only thing I could suggest is to try running it in compatibility mode, that should work. @all: Can anyone say me how to get this S*** working on XP? EDIT: I mean SP 2! I only have SP 2 cause it's included in my XP Version! I downloaded the demo and it works fine on my vista. However, I have the disc for the full version but it won't let me run the setup. It gets as far as the "Preparing setup" then my computer acts as if I never ran the setup! Okay, like many of you, I had problems loading Armada II on my computer, similar to ST_and_SW_Freak. However, I recently got the game to load up fine on both a Vista system ,and my own XP system. The first thing that I did was remove the virtual drive. For some reason, this was causing the setup to go into a feedback loop. After that, the game loaded fine. One quick note: if you have McAfee running, temporarily disable it. It squaked at me, proclaiming that it did not recognize the program, that it was evil nad that it was going to summon the Terminators (can anyone guess what my feelings are towards this software?). If you don't, let McAfee know that you trust the program, and then you'll probably need to restart the setup. The Vista system that I used was at work, and it's a pretty clean computer, with very little add on software. This was how I deduced that a virtual drive was causing my problems. Hopefully this will help out a few fellow gamers. Take care!